Configure the Marketing Cloud connection to the Salesforce CRM org. Configure the Salesforce CRM org’s connection to the Marketing Cloud account. 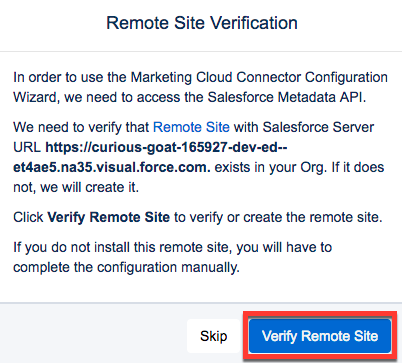 Now that you’ve installed the managed package in the Salesforce CRM org, it’s time to go through some additional configuration steps in both environments to complete the setup. Connect your Marketing Cloud account to the corresponding Sales or Service Cloud org at the account level to continue the Marketing Cloud Connect setup. Before you begin this process, log out of Salesforce. (Merely closing the tab doesn’t log you out.) This is to prevent an incorrect connection, because during the process, the system would automatically connect to any active Salesforce session, which we don’t want. Log in to Marketing Cloud. Hover over your username and select Administration. Hover over Account and select Salesforce Integration. Make sure Scope by User is deselected. Click OK to acknowledge the popup window. A login page displays in a new window. 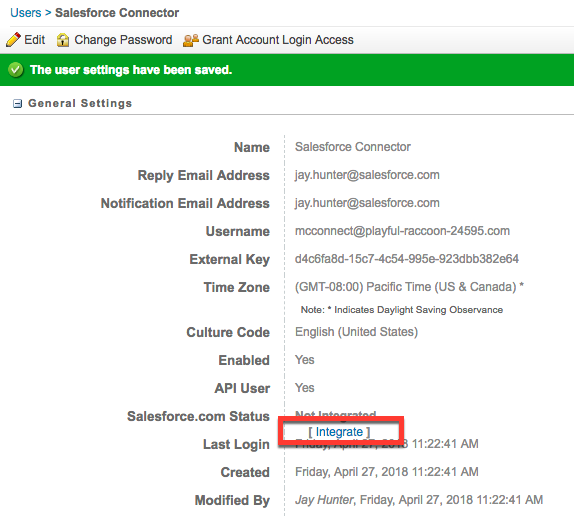 Enter the username and password for the Salesforce System User that you created in the last unit. If you are using a custom domain, select Use Custom Domain and enter the domain address before entering the Salesforce System User credentials. Click Allow to grant access for the Marketing Cloud API user to access the CRM org. We just connected from Marketing Cloud to the CRM org. That established a connected app relationship inside Salesforce CRM. 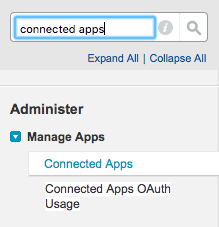 Now we need to log back in to the CRM org and make a few updates to the connected app settings. Make sure a system admin performs the following steps in the CRM org. In Setup, type Connected Apps in the Quick Find box and click Connected Apps. Under Permitted Users, select Admin approved users are pre-authorized. If a warning message appears, click OK. Under IP Relaxation, select Relax IP restrictions. Under Refresh Token Policy, select Immediately expire refresh token. Scroll down the page and click Manage Permission Sets. Select the Marketing Cloud Connected App permission set that you created in the previous unit. You can stay logged in to the Salesforce CRM org for now. You will be returning to it shortly for some further configuration steps. Just like in the CRM system, Marketing Cloud requires a user account for its connection to the CRM environment. It’s a best practice to dedicate a user license solely for this purpose. Here’s how to set up your Marketing Cloud API User. In Marketing Cloud, hover over your username and select Administration. Hover over Account and select Users. Enter your email address for the Reply Email and Notification Email Address. Enter a unique username. We suggest MC-SF-API-User. Leave the External Key field blank, unless your organization requires it. Finalize the Marketing Cloud API User setup by assigning roles. Click Account > Users from the Administration home page. Select the checkbox next to the Marketing Cloud API User you just created. Log out of the Marketing Cloud environment and immediately log back in with the Marketing Cloud API User credentials you just created. Now it’s time to head back over to the CRM org to finish the Managed Package configuration. The admin performs the following steps in the CRM org. 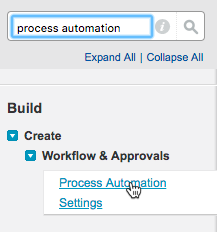 In Setup, type Process Automation in the Quick Find box and select Process Automation Settings. If the Default Workflow User is empty, click and specify a user with System Administrator permissions to be the default workflow user. We suggest using the Salesforce System User account you created in the previous unit for this. In Setup, type Session Settings in the Quick Find box and click Session Settings. Yes, that’s right: You don’t actually change any settings, but this is a necessary step for the configuration. Click to navigate to the All Tabs screen. Click Start Wizard to begin the setup wizard. The next screen is a prompt for the Default Workflow User you created earlier. Click Next. 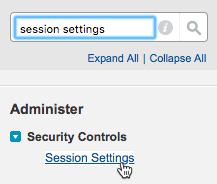 Click Next to move forward and acknowledge you’ve saved the Session Security Settings. Click Next to acknowledge Field-Level Security information. Click Done to acknowledge the page layout update information. At the main Marketing Cloud Connector Setup screen, select I agree to acknowledge the automated changes that the wizard will perform, then click Configure Marketing Cloud Connector. If all goes well, you are rewarded with a configuration summary. Click Okay! to finish the setup wizard. 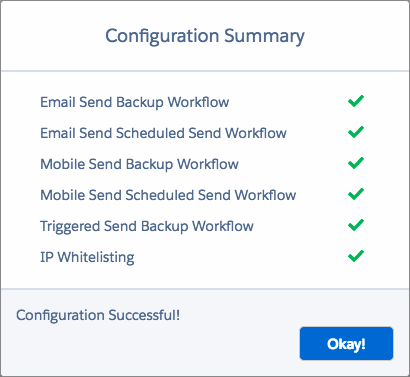 Now that you’ve finished the managed package configuration, it’s time to actually connect to Marketing Cloud from CRM and configure settings for the integration. Make sure you are logged out of the Marketing Cloud before completing this section. Merely closing the tab does not log you out. Click Connect to Marketing Cloud. Enter the username and password for the Marketing Cloud API User. Click Login. If you’re successful, you see a screen to configure Marketing Cloud Connect settings. Under the Account section on the page, select Email. In the Sends section, select all options. In the Notifications section, enter the appropriate email address to receive any error messages from Marketing Cloud Connect. In the Tracking section, select appropriate options for your organization about the specific email tracking data that Marketing Cloud sends to the CRM system. Keep in mind that the choices you make for these can affect the overall storage of your CRM org. Leave the defaults for the rest of the settings and finish by clicking Save Settings. Select at least one business unit from the Business Unit Management screen and click Save. Once you’ve finished and tested the initial configuration, it’s a good idea to learn all about these settings and adjust them if necessary for your organization. See the Resources for details on what these settings mean and their potential impact on your implementation. With the connection established in the CRM System, we can now finish the Marketing Cloud user integration. In the Marketing Cloud, hover over your name and select Administration. Click the name of the Marketing Cloud API User. Click Integrate in the Salesforce.com Status field on the user general settings screen. Enter the username for the Salesforce System user and click Save Settings. If you’re successful, the Salesforce.com Status is Integrated. We’re almost finished! One of the coolest features of Marketing Cloud Connect is its automatic synchronization of data between Marketing Cloud and Salesforce CRM. To make this work, we need to configure some basic field mapping. We specify the relationships between subscribers in Marketing Cloud and the corresponding fields in the Lead and Contact objects in Salesforce CRM. Log in to Marketing Cloud with the Marketing Cloud API User credentials. In Marketing Cloud, hover over Email Studio and click Email. Hover over Subscribers and select Profile Management. On the General tab, type First Name in the top text box. 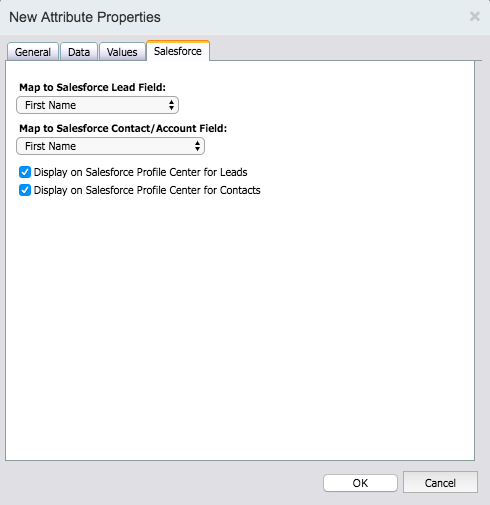 Select First Name in the Map to Salesforce Lead Field picklist. Scroll down in the Map to Salesforce Contact/Account Field picklist to the Contact General section and select Last Name. Select both checkboxes to display on Salesforce Profile Center. Repeat steps 3–9 to create a second attribute, substituting Last Name for First Name. Congratulations—you did it! Marketing Cloud Connect setup is now complete. In the next unit we run through a scenario to test the connection and make sure everything is working properly.